Tomatoes are in full swing and my dad’s heirlooms are especially sweet now. Here is a quick and easy lunch recipe I threw together last weekend. 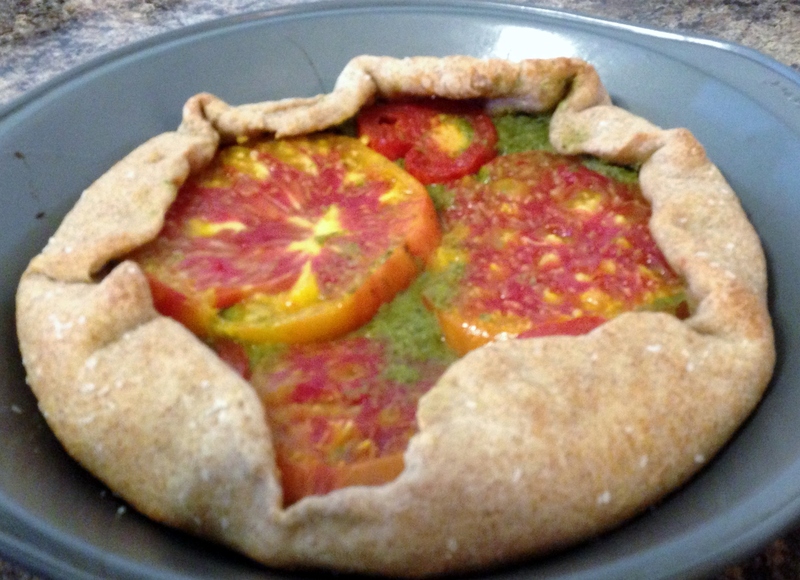 I love tomatoes and pesto, so I had eyed this recipe up since it was posted in early in August. The original recipe (here) has how to make crust from scratch. I was lazy and had pizza dough on hand, so I just used that to make two galettes. Preheat oven to 400F. Spray a cookie sheet and/or pie tin. I made one in a pie tin and one on a cookie sheet. Roll out dough to desired size. 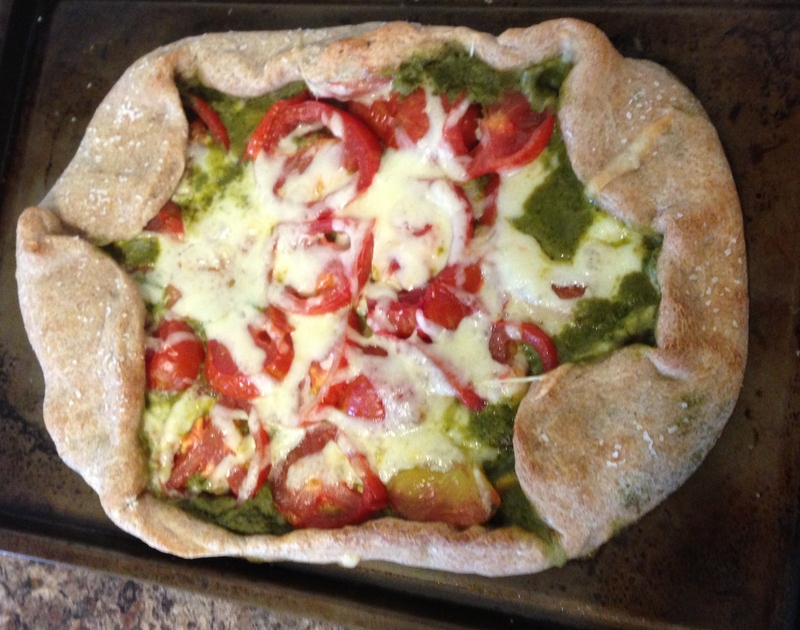 Spread a generous amount of pesto and top with tomato slices. Top with cheese, if desired. This recipe was something we quickly threw together on a Sunday afternoon for lunch. We had a ton of kale left from the CSA and there was a chance we’d be getting more on Tuesday. Originally I thought I’d make kale brownies again, but opted to make real food instead. For some reason, when I think of kale, I instantly think of sausage. While we didn’t have any sausage on hand, we had (and still have) plenty of ground beef. 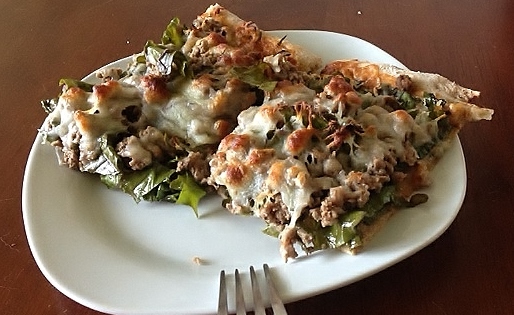 The end product was actually quite delicious and super filling – definitely a man’s pizza. Preheat the oven to 425F. Prepare pan with cooking spray. Roll out the pizza dough and press into the prepared pan. Thinly spread the pizza sauce over the prepared dough. Add kale and beef. Top with cheese. Bake in the own for 10-14 minutes, or until the edges are golden. Once you have homemade pizza crust, other pizzas just don’t taste the same. I made my first homemade pizza crust 2 years ago and I can only remember buying pizza once since then! I got the crust recipe from The Big Book of Vegetarian. It is great because it makes four crust that can be frozen for later use, so you don’t need to make a new crust every time. Here is a brief lesson in baking with yeast. Yeast eats sugar to ferment, so never omit sugar, no matter how “health conscious” you are trying to be. Also, sugar substitute will not work. Salt kills yeast; a little is good because it keeps the yeast “in-check” and prevents over proofs. However, too much will kill the yeast completely. The water temperature is VITAL for the yeast. If it is too cold, the yeast won’t ferment. If it over 115F, the yeast will die. I suggest temping the water every time you are making something with yeast. 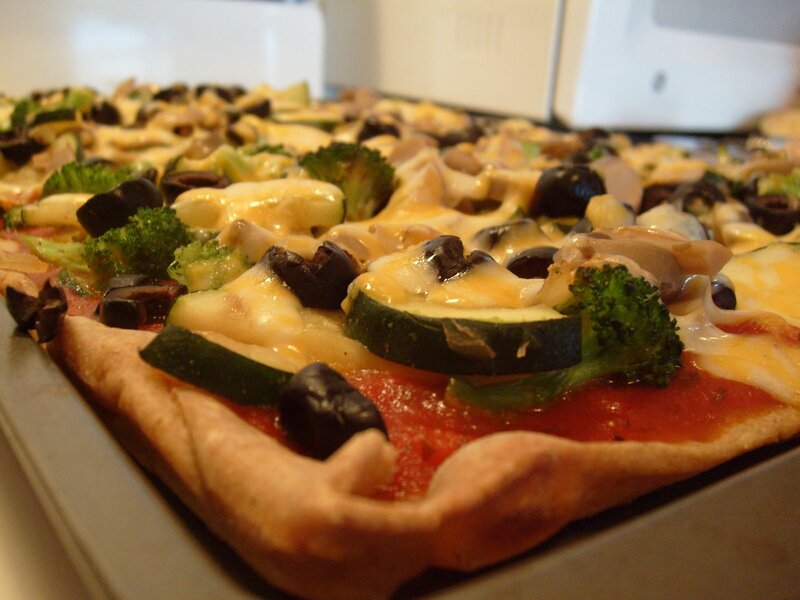 Pizza is one of those foods that everyone seems to think is forbidden, when in actuality, it can be quite healthy. This crust is half white, half wheat and the pizza is loaded with veggies and topped with a little cheese. While it is not like the triple cheese and meat pizza from your local chain pizza joint, it taste 100% better and is 100% guilt free 🙂 My guess is that each slice has 1/2 – 1 serving of veggies, so eat up! * The original recipes is 3 cups of all-purpose flour and 2 cups of whole wheat flour; however, I have made it with 3 cups of whole wheat and 2 cups of all-purpose flour and it is has turned out. The only downfall is when you freeze the latter dough and thaw it at a later date, it doesn’t roll out as well. In a small bowl, mix the water, yeast and sugar; let stand for 10 minutes, or until foamy. I usually heat the water in a glass measuring cup and then just add these items to the measuring cup to save dishes. In a food processor, combine the all-purpose and whole wheat flours, eggs, and salt. Pulse to mix. With the motor running, pour in the yeast mixture through the feed tube in a steady stream. Process until the dough cleans the sides of the bowl and then process for 45 seconds longer (this takes the place of the kneading), or until the dough is smooth and elastic. I do not have a food processor big enough for this, so I do it in the old fashion way. I mix the flours and salt together in a large bowl, add the egg and mix well. I then add the yeast mixture and stir together. once 3/4 of the flour is incorporated with the yeast mixture, I take it out of the bowl and and work in the remaining flour. I then knead for 5-8 minutes, or until the dough is smooth and elastic. Put the dough in a large, oiled bowl and turn to coat. Cover the bowl with plastic wrap and let rise in a warm, draft-free location for about 1 hour or until doubles in volume. I usually place this in the oven (obviously when it is off). I have had the yeast double in as little as 45 minutes. Punch down the dough and divide into 4 equal parts. shape the pieces into balls, lightly cover with dough with a kitchen towel and let rest for 30 minutes (the dough will NOT double in volume). Again, I usually stick this in the oven. Roll each dough out. If you plan to save the dough for later, roll it out large enough to fit into a freezer bag (but don’t put it in yet). Wrap the dough in plastic wrap and then put into a freezer bag. You can freeze the dough for up to 3 months or you can refrigerate the dough for up to 2 days. *If you are looking for a health option, choose low-fat, part-skim mozzarella cheese. White cheeses are lower in fat than orange cheeses. Spray or coat a baking pan with olive oil. Roll out the dough to fit in the pan and place into the pan. Fold the edges over to form a small crust, if desired. Lightly coat the crust with olive oil. Bake the crust for 5 minutes on a lower-middle rack to crisp it up slightly. In a skillet, saute any vegetables you are using for the pizza in olive oil. Season as desired. When the crust is done, remove from the oven and lightly coat with pizza sauce. Pour some on the crust and spread with a spoon to evenly distribute. Top with vegetables (and any other topping you are using), followed by cheese. Bake the pizza for 5-7 minutes on the lower-middle rack. Let cool and cut into 12 pieces.